Measuring microscope systems are composed of high quality metallurgical microscopes with Japanese optics, precision X-Y stages and durable heavy-duty stands. Digimatic readouts are available for X, Y and Z axis and can be set for English or Metric measurements. Measuring microscope systems are available with a simple binocular viewing head, or a trinocular head configured with a camera for capturing and/or viewing live images on a monitor. This often helps operators perform visual inspection and measurement of small parts and components without complicated system preparations. Illumination provides relfected and/or transmitted light. The measuring microscope systems include 50x, 100x, 200x and 400x magnification and optional objectives can be added to increase magnification to 500x, 600x or even 1000x. 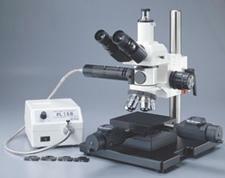 For questions about metallurgical measuring microscope systems please email us. What Magnification Do I Need?